Chongos Zamoranos, Mexican sweet curdled milk with sugar and cinnamon. 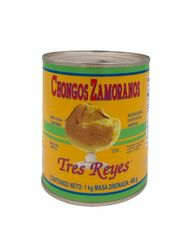 Chongos Zamoranos Tres Reyes a Mexican dessert with milk, sugar and cinnamon is the perfect dish for someone craving "something sweet". 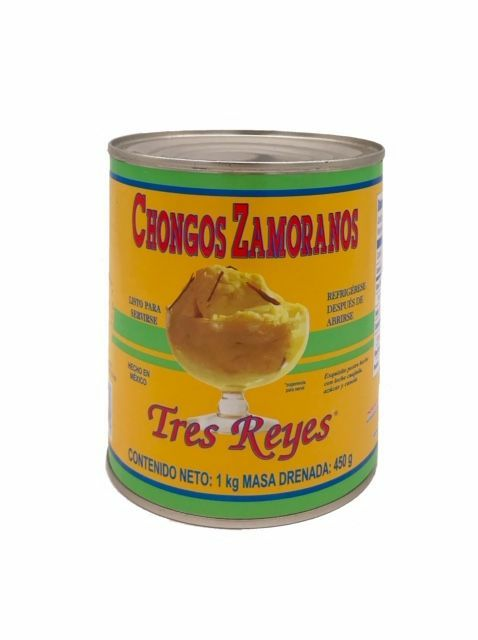 Chongos Zamoranos from Zamora, Michoacan Mexico is a Mexican Dessert, something like Sweet Cheese Pudding In Syrup. Sweet curdled milk chunks. Mexican dessert made with gelled milk, sugar and cinnamon. Ready to serve. 8 servings. I bought this item for my husband who has been looking for this item here in Cali but has always came up empty. He said while his mother was alive she would feed this to him so they kinda held a sentimental value to him. So needless to say I had to buy him a can to make sure these were the right things since I had no idea what chogos were. As soon as he opened up the box he began to cry and thanked me cause they reminded him of his mom. Will be ordering again. Very fast delivery, product as expected, no hassle great service. product a bit overpriced thought. reminds me of chongos served in restaurants in Mexico City. Great sweet dessert or snack!!!! You just can't go wrong!! !